I love crafting for Valentine’s Day. Most of my crafts revolve around my kids, with a few pretty grown up decor pieces thrown in here and there. My oldest is 5 and is at a point where she can and wants to get crafty with me. This year I thought it would be fun to have a girl’s craft day and make personalized candy pouch valentines for friends and family. Crafting with kids can be a blast when entered into with the right mindset. When sitting down to craft with kids (mine are 2 and 5) there are a few things you need to do first. Plan and prep. Know what you are going to make, gather supplies, and have everything ready to go. Kids have short attention spans so plan something easy and fun that they can complete in a short amount of time. If they love it they can make more. If they get antsy you can move on to the next idea. 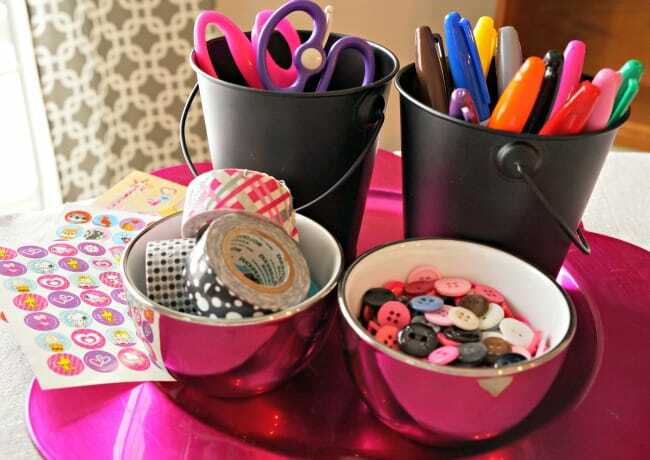 Make it an event, set a pretty table and let them use some of your special craft supplies. Set realistic expectations. I often have visions of magical perfect moments with my girls, which rarely happens. If I go into an event like this knowing it will get a little crazy we all enjoy it so much more. Treats and crafts go so well together. 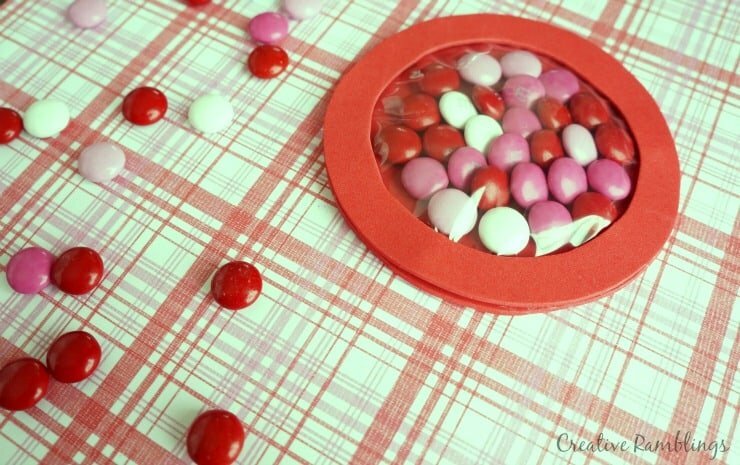 A Valentine craft day is bound to involve candy. 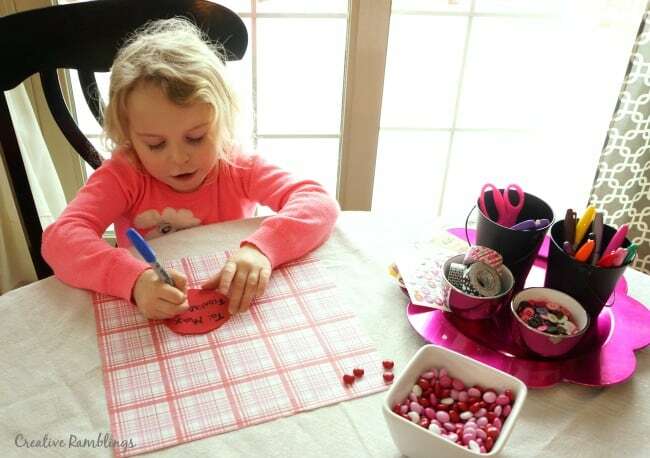 Let the kids enjoy a few treats while they are filling the Valentines and join in. 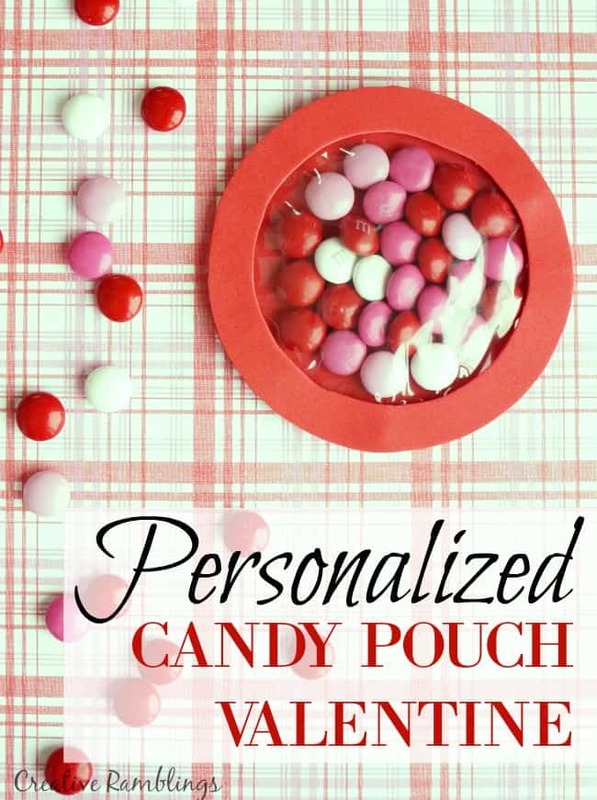 For this Valentine craft day I chose to make candy pouches filled with personalized MY M&M’S. These candy pouches can be made in a variety of shapes. We opted for simple circles using red foam. My daughter helped cut the circles, one solid, and another with a smaller circle cut out of the center to make a frame. Next she added personalized MY M&M’S to the center of a foam circle and I covered it with half of a plastic sandwich bag. I then hot glued the bag around the candy and glued the frame over that. This craft can be done mostly by kids with adults helping with hot glue. After everything was dry my daughter decorated and addressed the pouches to her friends. We filled our candy pouches with personalized MY M&M’S. You can create your own blends with 25 colors and add a personal touch with your photos, messages and a clipart library for any occasion printed right on the candy! I love the little hearts and messages on red and white candies. Not only do we love how they look, they make a great snack during a craft night. Crafting with kids really can be enjoyable, just keep these simple tips in mind. 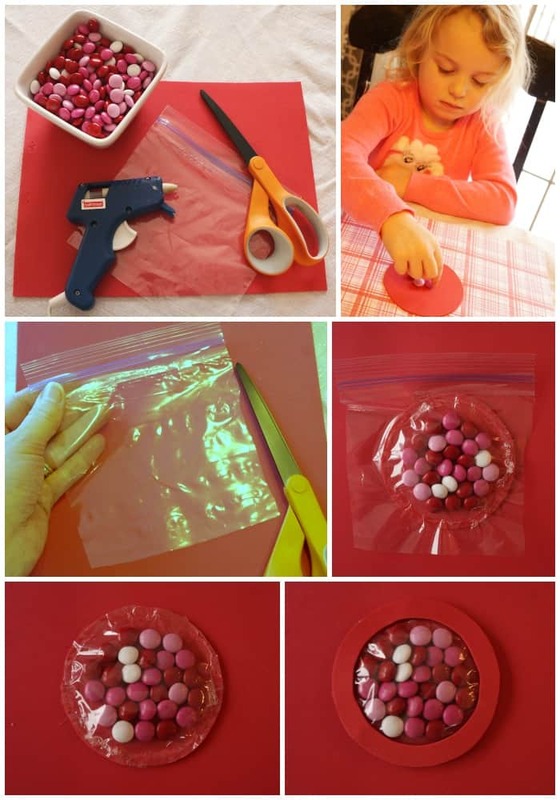 I had a blast making these candy pouch Valentines with my girls and they loved the experience. 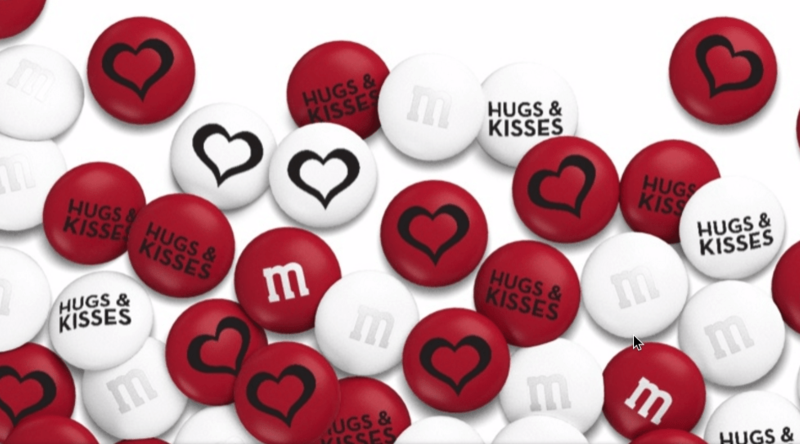 If you are ready to make a statement Valentine, check out the MY M&M’S inspiration gallery and choose from their creations or make your own. What kind of Valentine would you create with My M&M’S?